A good quality dog crate can give your pooch a safe, happy place to sleep at night, as well as help calm an aggressive or overly excited dog. Crate training can also give you peace from a high energy puppy who would otherwise keep you up at night, or who gets destructive when left to roam free when you’re away from home for the morning. With all of the great reasons to crate train your dog, a few tips might come in handy as you start the process. Here are a few tips we’ve culled from experts. Placing blankets, favorite stuffed animals, or other toys in the crate will help your dog feel welcome in his crate. When you first acquire a new crate, leave the door open and set it in a familiar place like the living room. Let your dog explore the crate, get a feel for it, and feel safe with it before you transfer her to the proper sleeping area where the crate will reside. Use treats to encourage your dog into the new crate. If possible, use a treat-filled puzzle type toy to encourage your pup inside the crate. Playtime and treats in the crate will help breed familiarity. Be sure to look out for signs of anxiety, separation anxiety, or illness. You should never crate a dog when these issues are taking place. Seek professional help to ensure the safety and welfare of your pup in the case of symptoms like vomiting, soiling the crate, or excessive drooling while in the crate. There are several things to keep in mind as you select the right crate for your pooch. The crate should be only large enough for your dog to go in and turn around in. The crate needs to be comfortable for your dog. If your dog is sensitive to certain textures, gets scared easily, or has any other distinct quirks, be sure that the crate you select for him will fit his personal needs. Determine if you need only a home crate, or if you need a crate that can travel with you. 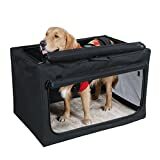 We think the Petsfit Travel Pet Home is the best dog crate for travel. This crate has comfortable mesh and fabric sides and top, with both top and side entry points for your dog. The Petsfit Travel Home sets up easily and quickly without any tools. Secure door latches and easy to operate. Four way ventilation. If you have to fly with your dog, you need to use a plastic crate for safety. The Petmate Sky Kennel is our top option for airline travel crates for dogs. It’s heavy-duty, durable, meets airline requirements for safe travel, and has optimum ventilation for Spot. A food and water dish clip into this crate to help make travel a little more comfortable for your best friend. 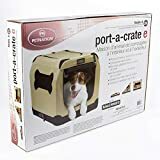 The PetNation Port-a-Crate is a top contender for travel crates for smaller dogs. These soft-sided, easy-assemble crates are lightweight, and made with a very durable steel frame. This crate is perfect for gentler, calmer dogs that travel with you. 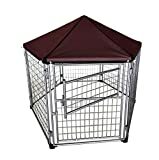 The Midwest Life Stages Folding Metal Dog Crate is the best dog crate as far as a number of rating sites are concerned. This crate comes in a variety of sizes, has a divider panel, carrying handle, rubber feet, and a leak-proof plastic pan. Ideal for traveling, camping, hunting and more! Good for dogs, chickens, ducks, rabbits and more! We love this crate for outdoor dogs. The Adventek Gazebo comes with a water-resistant cover, a securely latching gate, and is easy to set-up. This crate/kennel is great for dogs that need a little more space as they enjoy the outdoors. The SmithBuilt Heavy-Duty is another top rated crate on multiple sites. This particular crate is exceptionally heavy-duty, and designed for use with dogs that tend towards aggression or high excitability. If you’ve got a large or aggressive dog, this is very likely the right crate choice for you. If you’re getting a new dog, or just need to make some changes with your current furry friend, crate training is highly recommended for safety, health, and a happier life for everybody. 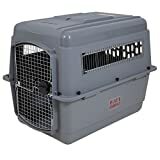 Find the best dog crate, use proper training techniques to keep your pal safe, and consult experts if you have any concerns about your dog’s behaviors or health.